Did you think I was going to leave you with a half head of two cabbage varieties after last week’s fish tacos? Not to worry, that’s not how we do things around here. 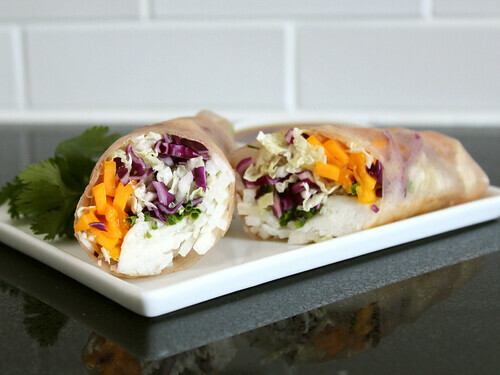 While our focus is still the sweet, mild-flavored, sustainable barramundi from Australis, sesame-dressed cabbage plays a supporting role in these spring rolls along with ripe mango, crunchy jicama and some savory punch from chives and serranos. I’m big on textures — and finger food — and these rolls cover all the bases. There’s a great sweet-savory-spicy-nutty flavor combination going on in the rolls, but to bring it on home I encourage you to whip up a quick ginger ponzu for a little citrus tang. Ponzu — essentially a Japanese citrus-soy-rice wine vinaigrette — isn’t traditionally gluten-free, but it’s totally easy to whip up a homemade likeness infused with a bunch of fresh ginger. It’s fantastic as a dipping sauce for the rolls, and I bet it would make for a great marinade base for the barramundi under different circumstances (just don’t let it marinate for too long given the high acid content!). You’ll love these refreshing rolls as a main course or appetizer, especially during the hot summer months — they’re a new twist on a takeout favorite! Want to get your hands on some of Australis’ fantastic barramundi? You’re really in luck if you live in the Northern California area as they’ve recently launched their product for a limited time in select Northern California Costco stores — it can be found in the freezer section in two-pound bags (don’t worry, the fillets are individually vacuum-packed). It’s also available at retailers nationwide, for store locations click here. Check out the Australis Facebook page for updates and news on when and where you can find their barramundi. And if you’re interested in learning more about their cutting-edge, sustainable aquaculture practices — both domestic and abroad — click on the previous links or take a read of the following article from The Global Mail. Any leftover ginger ponzu can be stored in a covered jar or bowl in the fridge for up to one week. Not following a gluten-free diet? Feel free to substitute gluten-free soy sauce with conventional, or serve rolls with your favorite store-bought ponzu. Combine juices, mirin and ginger in a small (2-quart) non-reactive saucepan. Set over medium heat and bring to a boil. Remove from heat and allow mixture to infuse for about 30 minutes. Strain mixture through a fine mesh sieve into a glass jar or other nonreactive vessel, and stir in soy sauce and rice vinegar. Cover and refrigerate until ready to use. DO AHEAD: Ponzu may be made several days in advance. Will keep refrigerated for up to 1 week. While ginger infuses ponzu, cook barramundi. Arrange oven rack about 6″ from broiler; preheat broiler to high. Line a small, rimmed sheet pan with aluminum foil; set aside. Cut out 2 – 3 fillet-shaped pieces of parchment paper, equally space on prepared sheet pan (the unexposed portions of a full sheet of parchment will burn under a gas broiler); set aside. Rub barramundi fillets on both sides with a small amount (1/2 – 1 teaspoon each) sesame oil. Arrange fillets atop parchment on the prepared pan. Sprinkle fish with Kosher salt. Set pan under the preheated broiler, and cook just until cooked through and just beginning to caramelize (brown) on top (5 – 7 minutes). Remove fish to paper towel-lined plate, allow to rest until they reach room temperature. With a very sharp knife, cut barramundi fillets against the grain (lengthwise) into 8 strips total. In a small bowl, mix together red and Napa cabbage; set aside. Fill an 8″x8″ heatproof casserole dish with hot tap water, line a large plate with several sheets of slightly moistened paper towel. Submerge one rice paper wrapper into hot water, remove as soon as it’s pliable (about 15 seconds), and lay it out on the paper towel-lined plate. 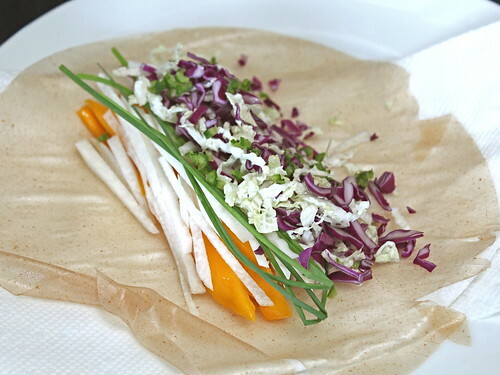 In the center of the paper, as shown above, arrange 1 strip barramundi, 1/8 each of the sliced mango (about 1 ounce), jicama (1/2 ounce), cabbage mixture (1/2 ounce), minced serranos (about 1/4 – 1/2 teaspoon) and chives (about 5 – 7 pieces). Drizzle about 1/4 – 1/2 teaspoon sesame oil over filling, focusing on the cabbage. As though you’re rolling a burrito, fold top and bottom sides of the wrapper toward the center (over filling), then fold left side over filling and roll tightly (but not so tight as to tear) until sealed. Please note that the wrapper may stick a bit to the paper towel, just peel it away gently as you work. Lightly moisten a sharp chef’s knife with water and cut roll in half at an angle. Repeat with remaining wrappers and filling. Serve spring rolls with a couple tablespoons of ginger ponzu in a dish for dipping (about 1 tablespoon per roll), and a few sprigs of cilantro on the side (if using) — the cilantro can then be added to the rolls for additional flavor if desired! ¹ I found Star Anise Foods brown rice spring roll wrappers at my local Whole Foods. To find them in a store near you, use their handy store locator. A case of 6 (approximately 100 wrappers) can also be purchased through the Star Anise Foods website or on Amazon.com.